The Speedfil Speedpack 3 is the perfect compact low-profile top tube storage for essential nutrition or repair items. The Speedfil Speedpack 2 is the perfect compact low-profile top tube storage for essential nutrition or repair items. The Speedfil Speedpack 1 is the perfect compact low-profile top tube storage for essential nutrition or repair items. The Speedfil Speedpak Saddle Bag is the perfect compact low-profile storage for essential repair items. The bag has internal dividers to easily organize and separate materials and keeps them from making noise. The exterior is water resistant to help keep your items dry. The revolutionary Speedfil Hydration System gives triathletes and cyclists the advantage to hydrate, ride and race faster on the bike. The standard Speedfil is down tube compatible only. FootShield is a perspiration barrier for your feet and helps keep them dry and odor free! A blend of natural antifungal, ingredients and moisturizers reduce and prevent sweaty feet, the growth of bacteria, athlete’s foot, blisters, and smelly shoes. FootShield works instantly to dry your feet and keep them dry. 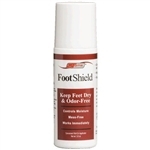 FootShield dries clear, dries quickly, will not rub off and has a fresh scent. Designed exclusively for women, 2Toms SportShield for Her! delivers the perfect balance of protection and comfort in a silky smooth formula that lasts all day. Durable and Long Lasting Triathlete and Figures Car Sticker. Dimensions: 4 x 6 in. SportShield applies a smooth, thin invisible coating to the skin. This coating will eliminate or greatly minimize the friction that causes blisters, chafing and irritation. SportShield is Wetsuit Safe.